Shoko it’s a special day today. 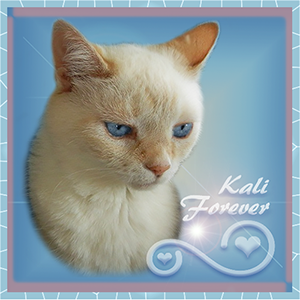 It would have been Kali’s 16th birthday. A real landmark. She is celebrating in heaven now but we won’t be unhappy cause she shared so many good times with us. Do you remember when you first came to live with us? I remember some things mom. You made Kali’s life a lively place. She was a knockout. 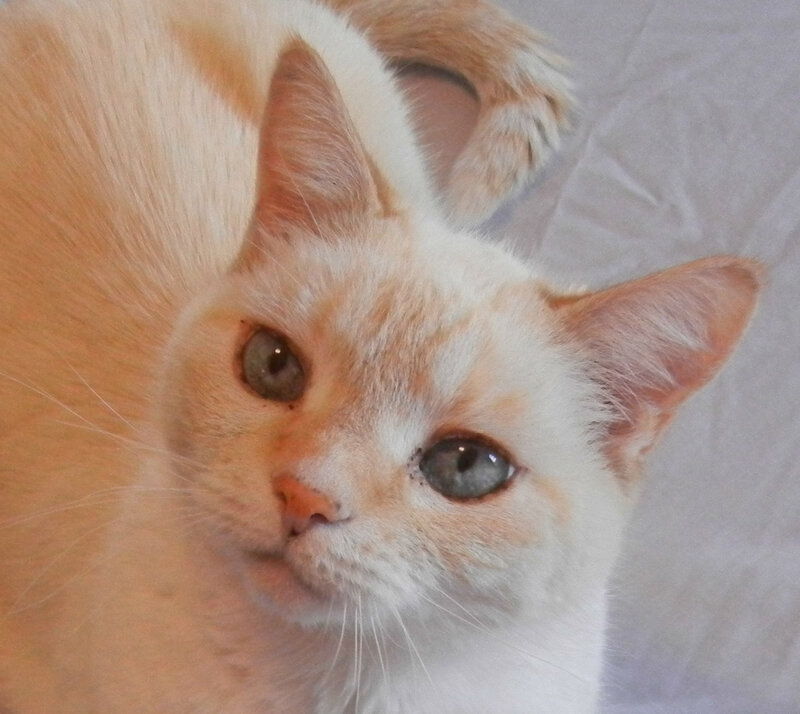 A cat that was born to be beautiful. She spent hours on her fur and paws. She hated bugs and would come inside at the slightest sound of a bug. 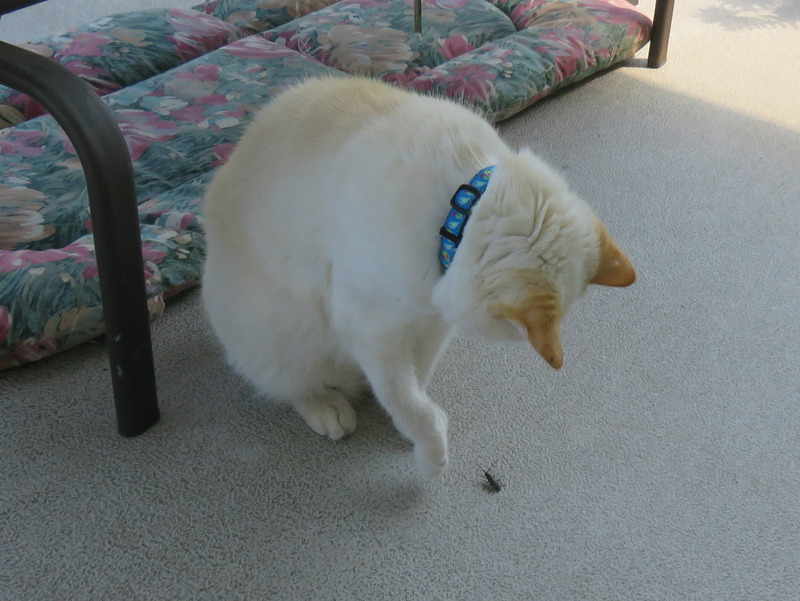 The one exception was if I brought her a stunned fly. She liked those. Remember how she loved oregano! She rolled in the oregano and then the dirt. MOL She loved it. You’re right Shoks. What a mess she was. She was happy though. We grew so very close. We would lay on the bed and listen to our Bedtime Story. So many memories. We are very fortunate to have such happy memories, Shoko. 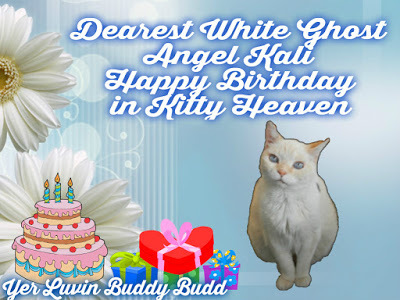 Look at the lovely card that Buddy Budd of Tomcat Timmy’s Commentary made up for Kali’s birthday. Fantastic card right from the heart… Kali will love this. Let’s gobble up this strawberry cake that the guys and Miss Fitz made over at Timmy’s Commentary. 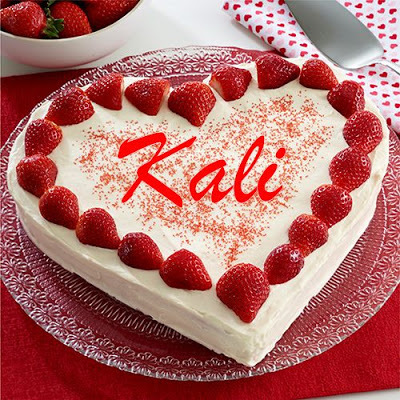 Kali’s favourite cake was strawberry. It tastes pretty darn good. Mmmm Go visit Timmy’s place and share your feelings. Buddy, we want to keep you here on earth for a few more years. 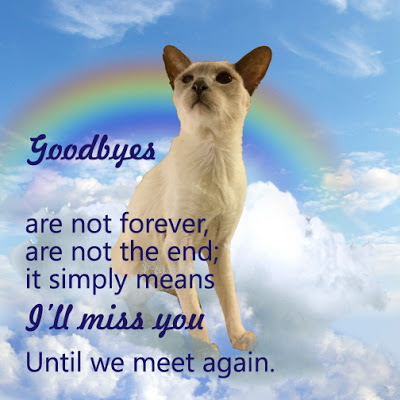 You will be with Kali again and forever. 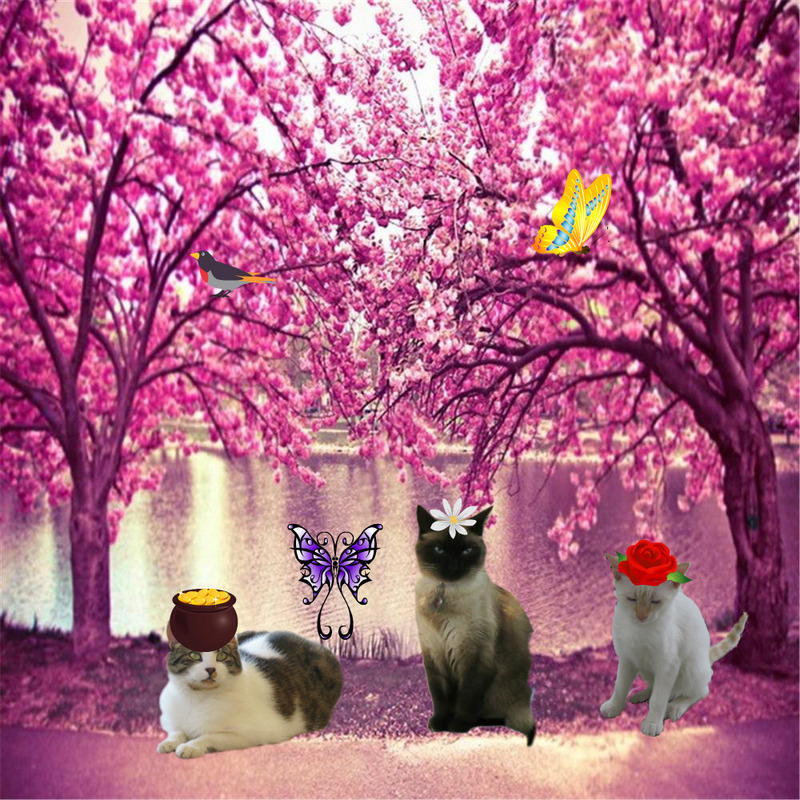 This entry was posted in Uncategorized and tagged cat, forever, happy, inside, Kali, memories, oregano, remember, strawberry on May 10, 2018 by The Canadian Cats. 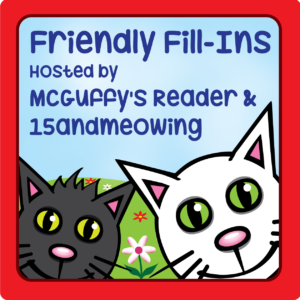 Today is the day for the Fill-Ins, hosted by Ellen of 15 and Meowing and Annie of McGuffy’s Reader. I will present the first two statements and Kali Kit the other two. 1. Keep calm and …..SMILE. THEY’LL NEVER KNOW YOU ENJOYED THEIR FISH BEFORE THEM. .
2. 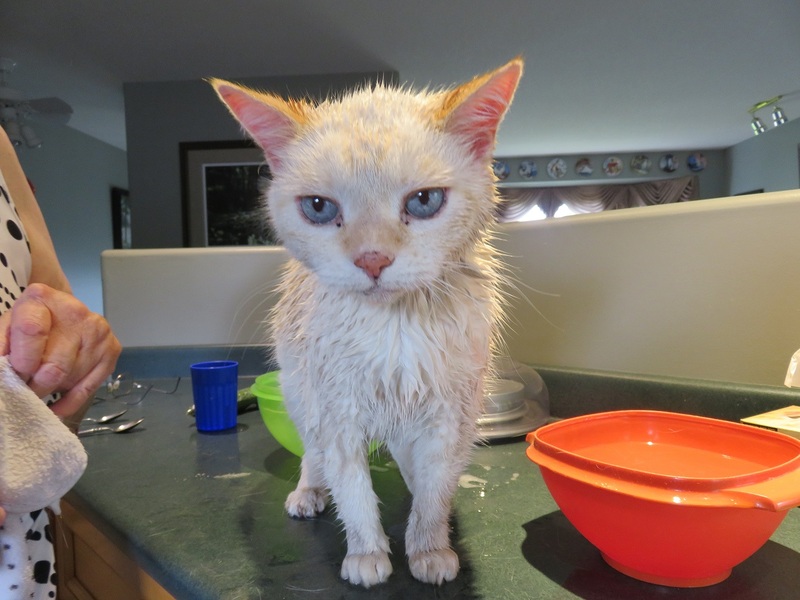 WINTER….. disappoints me. IT IS SO COLD THAT I HAVE TO STAY INSIDE UNTIL THE AFTERNOON WHEN THE SUN MAY COME OUT. NO MORE RUNNING OUT IN THE MORNING TO GO TINKLES. THE GROUND IS FROZEN AND THE TEMPERATURE FREEZES ONE’S TINKLE. BRRR… YOU SEE WE ARE WALKING OUTSIDE AIMLESSLY TO KEEP THE COLD AWAY. 3. OREGANO….. is my ….DOWNFALL. I LOVE OREGANO AND TRY MOM’S IN THE GARDEN EVERY YEAR. 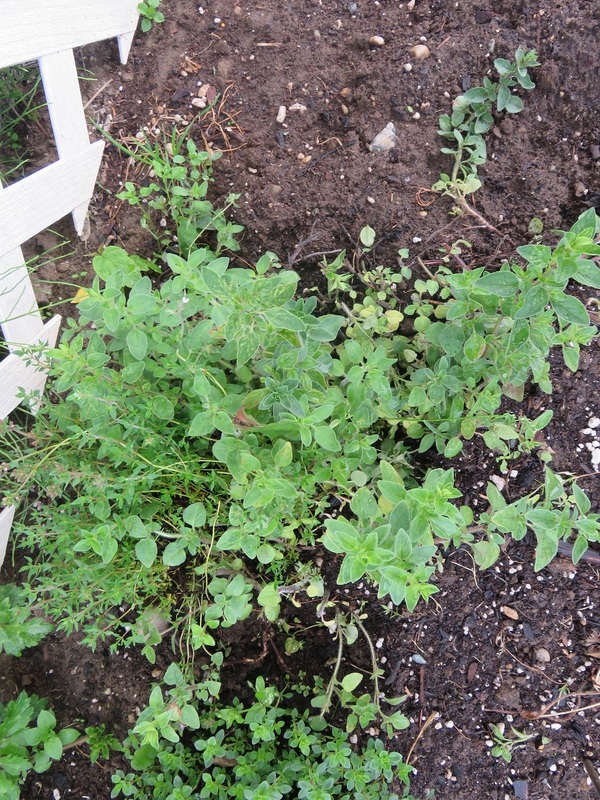 Yes, oregano is a perennial. 4. 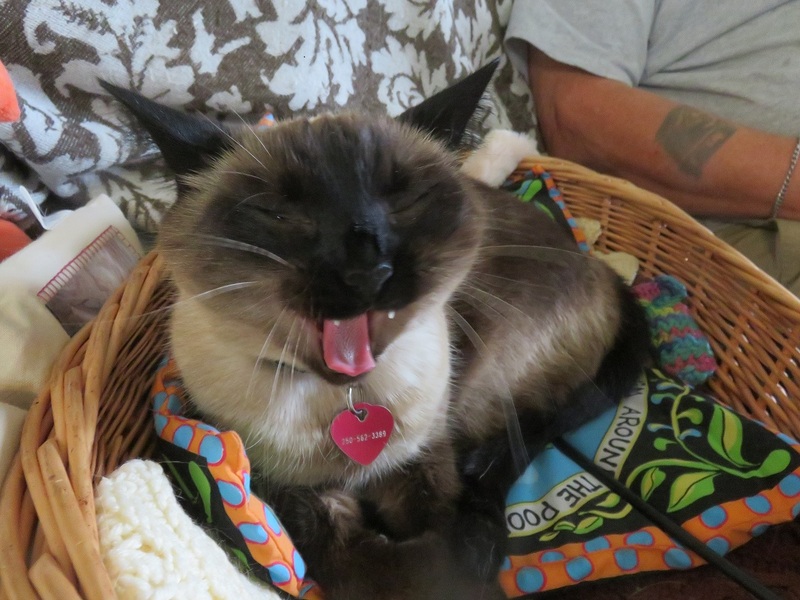 In retrospect, ….I WAS A GOOD KITTY MOST OF MY LIFE SO I CAN LET MY fURS DOWN OCCASIONALLY AND BE A LITTLE BIT HELTER SKELTER. 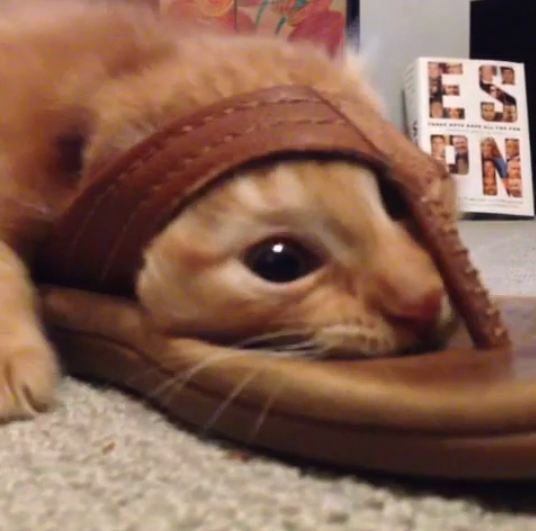 MOL…be good this weekend my friends and we’ll see you on the flip-flop. 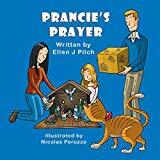 This entry was posted in Uncategorized and tagged cold, life, oregano, present, smile, tinkles on October 12, 2017 by The Canadian Cats. 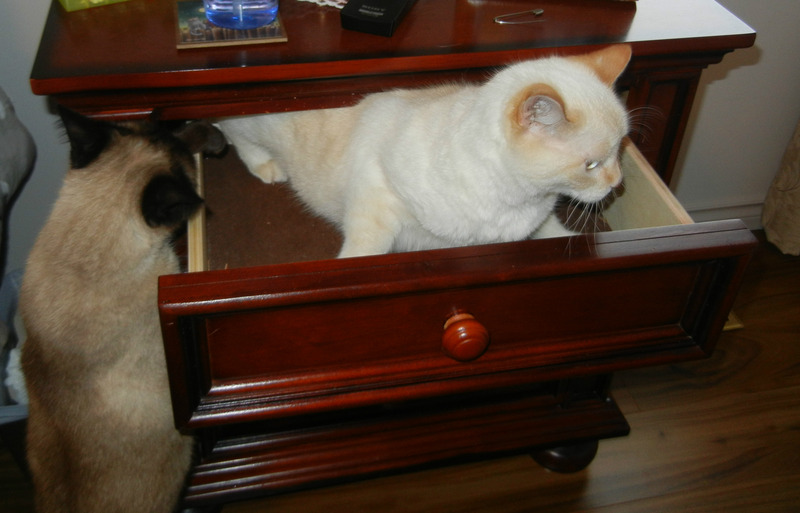 Ellen from 15 and Meowing blog and Annie from McGuffy’s Reader have given us the four fill-ins for the day. 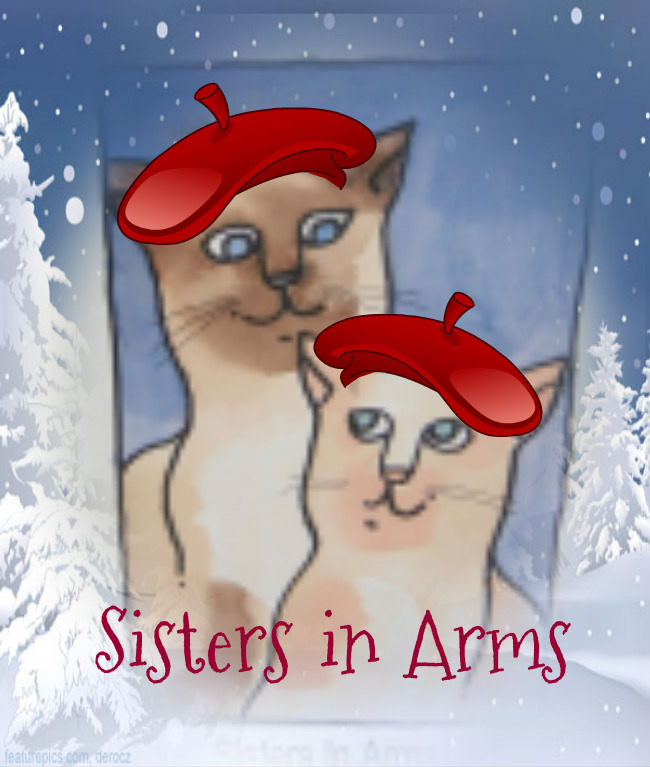 Click on the blog hosts name and go visit them….say hi for us. I go first this time Shoko. 1. My favorite herb or spice is ……OREGANO. HOW COULD ANYBODY NOT LIKE OREGANO, IT MAKES ONE FEEL LIGHT AS A FEATHER AND JUST A WEE BIT GIDDY. 2. 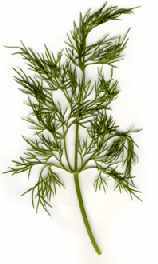 An herb/spice I dislike is …..DILL. IT SMELLS ODD, IN FACT IT STINKS. NO PROBLEM MOM I WON’T TOUCH YOUR DILL. LET’S PUT IT THIS WAY, I’LL EAT DILL WHEN YOU EAT VALERIAN ROOT. 3.Lately, I have been working on …..MY STALKING TECHNIQUE. I HEARD THERE ARE LAWS AGAINST STALKING THESE DAYS…..YOU COULD GO TO JAIL. ARE YOU JIVIN’ ME SHOKO? GEESH I’M STARTING TO SOUND LIKE YOU FOR HEAVENS SAKE. 4.This Winter was …..DIFFERENT. 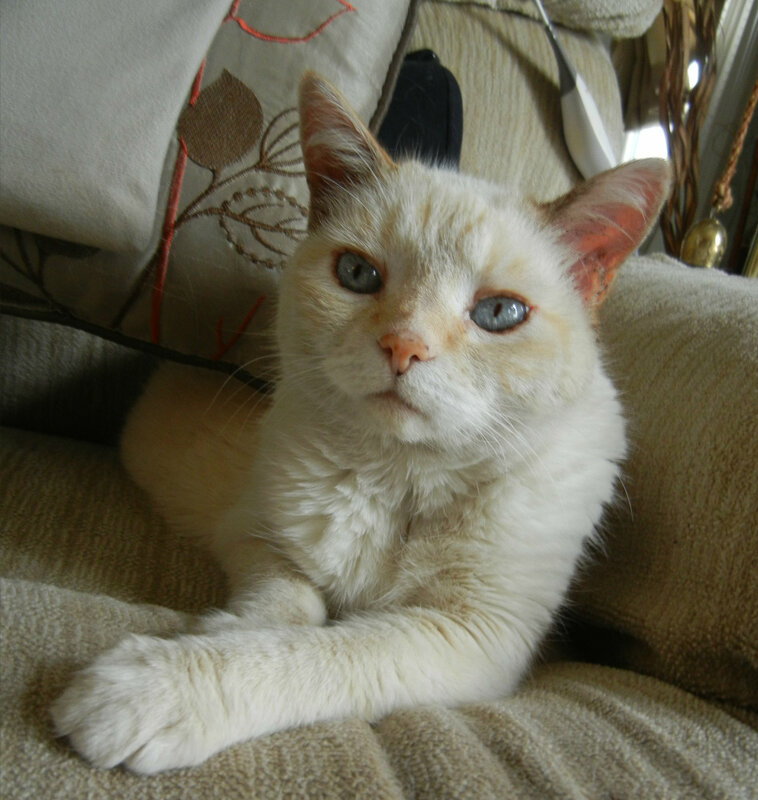 A FEW DAYS ARE COLD AS STINK, WHERE I AM SHIVERING IN MY FURS LOOKING FOR SOMEONE TO CUDDLE. THEN THE NEXT FEW DAYS ARE MILD. SO NOBODY GETS CLIMATIZED AND WE ALL KEEP FEELING VERY COLD. Have a great weekend and go with the flow. Mom is starting to make me breathe the Feliway Diffuser air starting tomorrow. Let’s see if I become calm and relaxed. 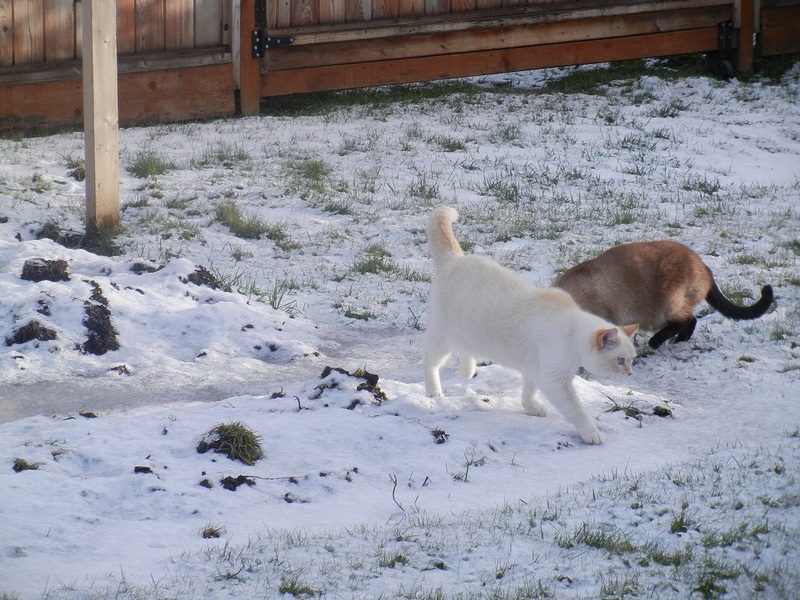 This entry was posted in Uncategorized and tagged calm, cuddle, eat, feather, flow, four, oregano, snow, stalking, stinks on March 3, 2017 by The Canadian Cats. Mom decided we better go look for Bashful again because its going to freeze overnight and even though Sky’s sis is used to this kind of weather, Bashful is not. So off mom and I went to examine more of the Lane. We looked into the car man’s junky vehicles. No sign of them. Nothing! We then headed over to the house that’s falling apart. I think they’re over here mom! I see some wiggle marks. I’ll go onto the property here at the falling apart house. There they are….in the long grass by the tree! Be careful mom, you don’t want to step on them. Let me go and tell them we’re here. Mom nods to me. Hi Bashful. How about if mom gives both of you a ride home in her hand. 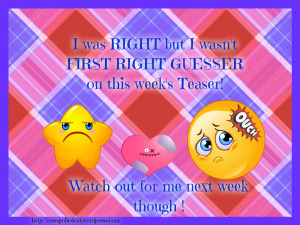 Mom, let’s see your hand….Bashful and his friend would like a ride home. Mom puts her hand down, Bashful and his lady friend hop on. Stop mom, let me look. My, my…..she is quite the looker. I’ll bet the boy rocks are beating a path to her door. Sis, I’m so happy to see you again. I thought maybe you were lost for good. I was so scared. You look so cold sis. Would you like some oregano to get warm. Yes, these peeps have oregano. I know, we’re really lucky. *yawn* You must be even sleepier than I am sis. Let’s go to bed and snuggle. I can’t wake these two just to find out the name of the bigger one. Don’t you know Bashful? You were with her for a few days. She never said her name. I guess we’ll just have to wait until they wake up. 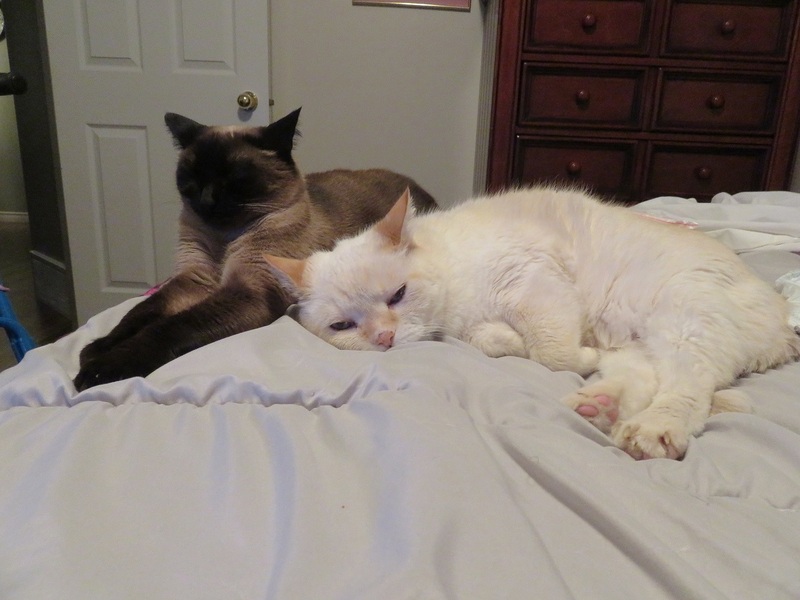 This entry was posted in Uncategorized and tagged bed, hand, happy, house, look, looker, lucky, marks, name, oregano, path, ride, sign, sleepier, step, vehicles, weather on September 21, 2015 by The Canadian Cats.